merry white wednesday to you! 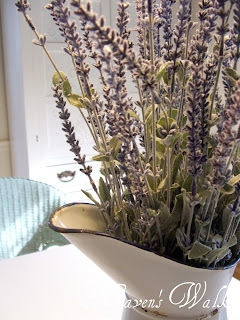 In my loo, white pine boughs replaced the lavender in my fav French tote. Service berries nestle with cedar sprigs in the kitchen. Vintage books made to look even older by ripping off the covers and binding with twine - laying in a bed of rustic linens on top of the living room armoire. to see your awesome Christmas decor! I hope that you all had a great holiday weekend! and lots of full tummies. dreaming about Christmas, of course. to transform the house for Christmas. you're going to have to wait a while to see what I did. That's the BEFORE entry light. Pretty in it's own Victorian-like way. You can see the other new light I purchased over the sink. The new entry light looks like it's been there for decades. 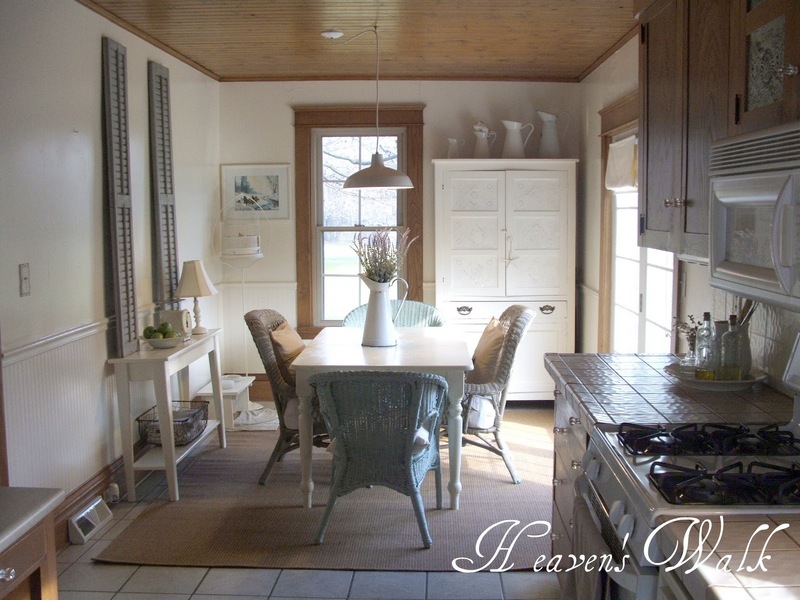 It fits with the French farmhouse feel weaving it's way slowly through this old house. "before and after" inspiration there! I decided that I had to make a visit to the Goodwill store that is located about 15 minutes from my home. I really didn't know what to expect. I had never been to one before. But I tell you - the parking lot sure was full. "That girl is one cookie short....."
from the people in line behind me. But back to when I first entered the store. My radar was set on 'High' as my eyes scanned the entire building. People were scurrying around pushing carts brimming with goodies. "Ok, Self. Time to dive in!" After cruising around the entire store and feeling disappointed that I had not one thing clutched in my anxiously sweaty mitt, I found myself standing in front of a large wall covered with framed pictures. as I casually pretended that I was not looking at them at all. and tried to hide it under my coat without looking like I was stealing it. my eyes landed on some white treasures neatly stacked on a shelf. ran awkwardly gracefully to the check out gal. she casually mentioned that a woman had purchased a very very ugly painting there a week ago. and discovered a $2,000 savings bond. but common sense stopped me. This is what I took home off the ugly wall for a mere $2.99. A nice place to leave sweet notes to my hubby. Oh, and the great white find that caught my attention? Yup. It did me, too! I'm so grateful for Goodwill stores! Good morning, my fellow bloggettes! 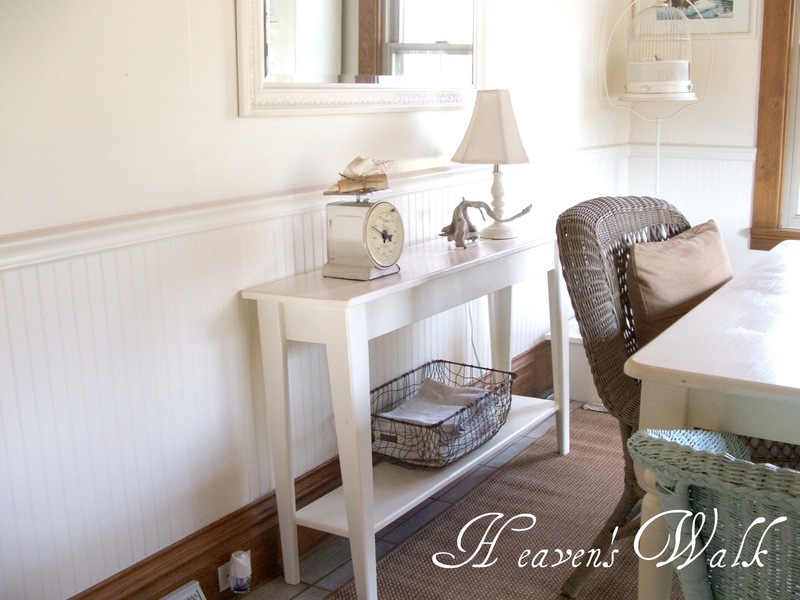 all of your sweet comments after my post on how Heaven's Walk got it's name. Your encouraging statements and wonderfully touching stories about the furbabies who you love and care for melted my soul. We are blessed that they have left paw prints on our hearts! The refloofing and refluffing has continued into my loo. The loo that our guests use. the glazing technique the previous owners did on them. that is painted creamy white. if were up to me. in all of her stunningly naked glory. but, I just don't have an answer for you. But we've kept her up there. She's quite the conversation piece. I bought the bucket for $1 at my friend's antique shop. I used it for a "pickin' pot" this summer in the veggie garden. (which was still 50% off). purchased from Tracey at French Larkspur. 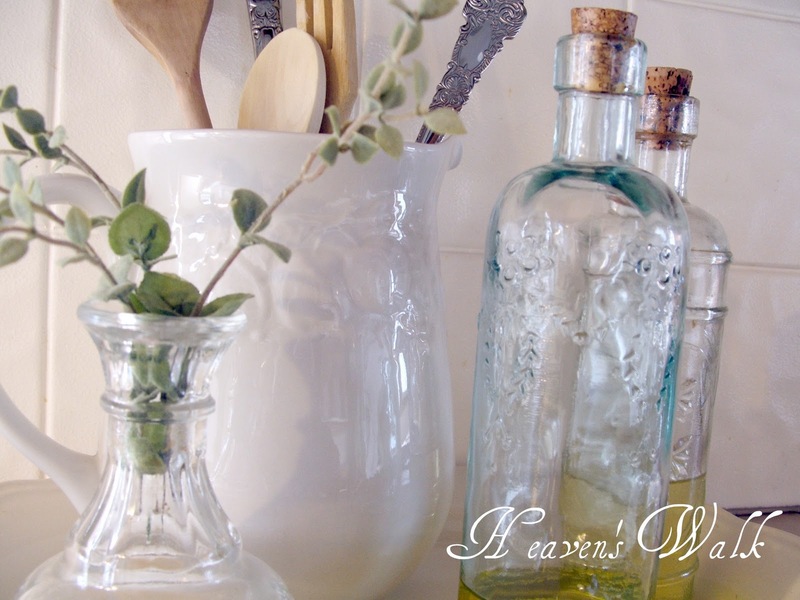 Vintage bottles were a Hobby Lobby find for a mere $2. Vintage cheese box was found for a song on Etsy. Believe it or not, I found this French soap at a local grocery store! 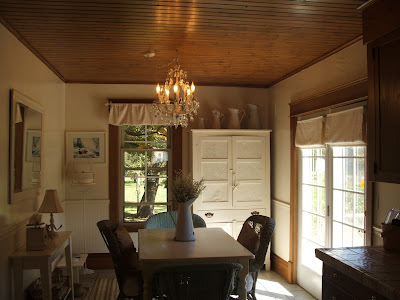 Someday, I would like to put wood floors in this room to tie in with the rest of the original oak flooring in the house. Anyway, so there you have it. done for a song and a dance. "Refloofing: Part 2 - The Loo" is officially completed! Linking with Between Naps on the Porch for Met Monday! all on a wonderful White Wednesday at Faded Charm! I very much needed to make some changes in my house. 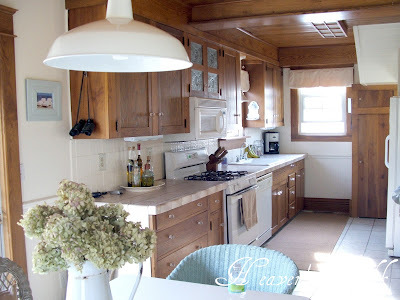 Small, affordable changes that would make a big, beautiful impact. I very much wanted to feel like I'm living in a francais du ferme (French farmhouse) close to the sea. The very first thing I did was change out out the striped, summery, beachy looking rugs for indoor/outdoor sisal rugs in a warm caramel color. They instantly provided a calm atmosphere to the room. 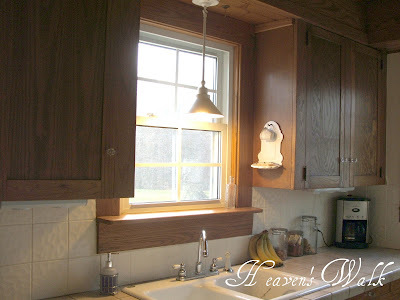 Two new farmhouse lights, one over the kitchen table and one over the sink (that hubby so kindly hung last week after days of nagging by his loving wife) were the next additions. I purchased them with my CSN gift certificate I won from Jo's (at Secret Garden Cottage) giveaway quite a while ago. I was in such merchandise overload upon my first visit there, it took me this long to decide how to spend it! Removed most of the bottles of flavored olive oils from the counter keeping only the ones used on a consistent basis. Added white ironstone pitcher filled with our wood cooking utensils next to a cute little vase with herb sprigs in it. Removed wood block knife set from counter (which hubby won't dare whine about - especially after I inform him what bacteria carriers they are!) and placed constantly used ones in a nearby drawer. Removed framed beach-chaise picture which will be replaced with a vintage wire hook rack (that I am actually making!) 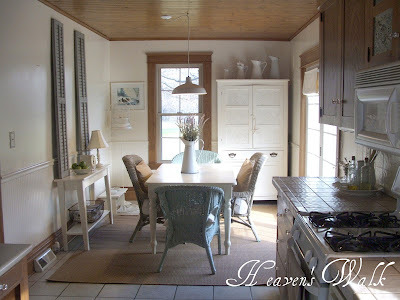 where some sweet things will hang from twine. 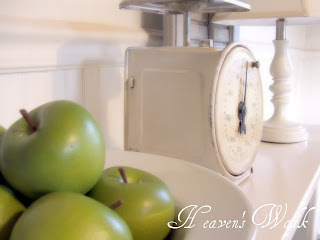 Added white ironstone bowl filled with green apples on buffet table next to the vintage scale. Removed valances from windows - which instantly brightened the room and emphasized our tall ceilings. Oh.....you wanted to see photos? What did I learn from Jo? 1. Don't be afraid to declutter and put things out of sight that aren't used frequently. 2. 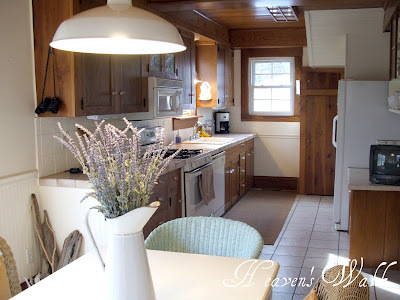 Don't be afraid to just move things around from room to room. 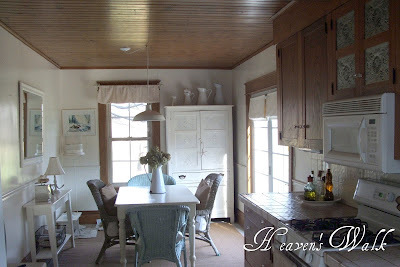 I never would have thought to put those shutters on TOP of that buffet table, but it works. 3. 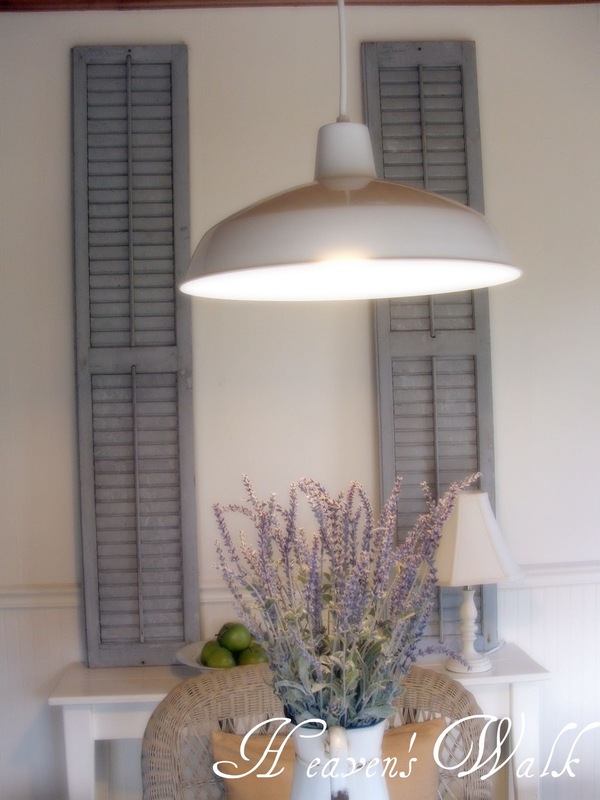 Use color-unified textures to create a serene feeling in a room. 4. 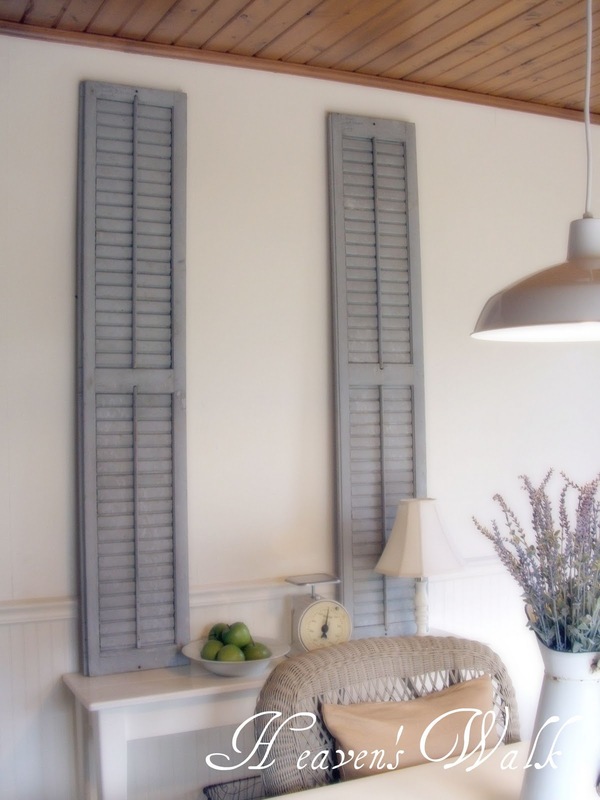 Look around your house to repurpose things you already have - and use them in a room that you wouldn't normally use or see them in. 5. 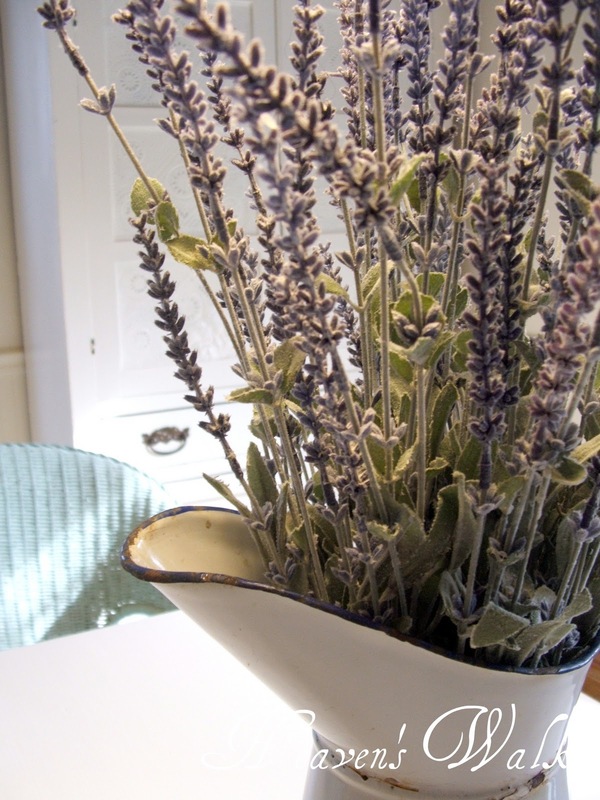 Be sure to incorporate nature into your home in some way. It keeps things real! As I continue to refluff, be sure to stay tuned for "Refloofing: Bathroom - Part 2". Have you refloofed a room recently? I'm joining Between Naps on the Porch for Metamorphosis Monday! 4. Been slacking, that is. 6. But for a good reason! 12. and I didn't know where to start. 16. and making her promise to be brutally honest with me. 18. and waited for her to lay her expert eyes across them and spew her decorating wisdom. 22. in a good way, mind you......not at Jo. 25. asking if I was still talking to her or not. 28. I forgot to drop her an email and thank her. 32. due to the fact that they carry everything under the sun for a house in need of refloofing. 36. loading my cart carts with treasures tagged with little stickers that say 50% OFF. 40. before she reveals the changes she's made thanks to her super-duper stylist friend, Jo.